The Striped bark scorpion and the closely related Baja California bark scorpion are also called bark scorpions. 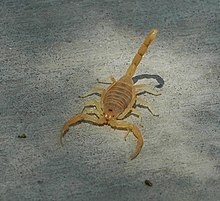 Bark scorpions are eaten by a wide variety of animals such as birds (especially owls), reptiles, and other vertebrates. Some examples include spiders, snakes, peccaries, rodents, and other scorpions. Development, pesticides and collecting scorpions for research or the pet trade also reduces the bark scorpion population. The painful and potentially deadly venom of bark scorpions has little effect on grasshopper mice. Scientists have found the scorpion toxin acts as an analgesic rather than a pain stimulant in grasshopper mice. Arizona bark scorpions have a gestation period of several months, are born live, and are gently guided onto their mother's back. The female usually gives birth to anywhere from 25 to 35 young. These remain with their mother until their first molt, which can be up to 3 weeks after birth. Arizona bark scorpions may live up to 6 years. While nearly all scorpions are solitary, the Arizona bark scorpion is a rare exception: during winter, packs of 20 to 30 scorpions can congregate. Bark scorpions, like most other scorpions, are incredibly resilient. During US nuclear testing, scorpions, along with cockroaches and lizards, were found near ground zero with no recorded adverse effects. The bark scorpion is particularly well adapted to the desert: layers of wax on its exoskeleton make it resistant to water loss. Nevertheless, bark scorpions hide during the heat of the day, typically under rocks, wood piles, or tree bark. Bark scorpions do not burrow, and are commonly found in homes, requiring only 1/16 of an inch for entry. Arizona bark scorpions prefer riparian areas with mesquite, cottonwood, and sycamore groves, all of which have sufficient moisture and humidity to support insects and other prey species. The popularity of irrigated lawns, and other systems which increase environmental humidity in residential areas, has led to a massive increase in the number of these animals in some areas. Centruroides scorpions are unusual in that they are the only genus in the southwest that can climb walls, trees, and other objects with a sufficiently rough surface. Bark scorpions practice negative geotaxis, preferring an upside down orientation, which often results in people being stung due to the scorpion being on the underside of an object. The bark scorpion is the most venomous scorpion in North America, and its venom can cause severe pain (coupled with numbness, tingling, and vomiting) in adult humans, typically lasting between 24 and 72 hours. Temporary dysfunction in the area stung is common; e.g. a hand or possibly arm can be immobilized or experience convulsions. It also may cause loss of breath for a short time. Due to the extreme pain induced, many victims describe sensations of electrical jolts after envenomation. Fatalities from scorpion envenomation in the USA are rare and are limited to small animals (including small pets), small children, the elderly, and adults with compromised immune systems. Extreme reaction to the venom is indicated by numbness, frothing at the mouth, paralysis, and a neuromotor syndrome that may be confused with a seizure and that may make breathing difficult, particularly for small children. Two recorded fatalities have occurred in the state of Arizona since 1968; the number of victims stung each year in Arizona is estimated to be in the thousands. In Mexico, more than 100,000 people are stung annually, and during a peak period in the 1980s, the bark scorpion claimed up to 800 lives there. An antivenom was developed for this species at Arizona State University by Dr. Herbert L. Stahnke, and produced in quantities sufficient to treat individuals within the state of Arizona. This antivenom was not FDA approved, but use within the state of Arizona was allowable and very successful in shortening the duration of symptoms and hospitalization. Production of this antivenom ceased by 2000 and the product was unavailable by 2004. A Mexican-produced antivenom, Anascorp [Antivenin Centruroides (scorpion) F(ab′)2, Laboratorios Silanes, Instituto Bioclon SA de CV], received FDA approval on August 3, 2011, and is now in use. Since the amount of venom a scorpion injects varies, Arizona poison control centers suggest immediate medical attention only in the event of extreme pain or stings involving weaker individuals. Bark scorpions, like most other scorpions, will glow when exposed to a blacklight. This is particularly useful in scorpion detection, since bark scorpions are active during the night, and can be easily spotted using this method. Typical UV LED flashlights enable their human operator to readily detect scorpions at a distance of approximately 6 feet. Newly molted scorpions will not glow under ultraviolet light for a few days after molting. Bark scorpions are tan or light beige tone in color and very small making them difficult to detect especially on natural terrain (rocky land, multiple vegetation and soil textured land). They are not known to seek out people but look for places to hide unless provoked or defending their young. Exterminators can be brought in to help control a scorpion population. The exterminator will apply pesticides inside and outside the home. Pesticides such as Cyzmic CS and Temprid SC work well as they are known to penetrate a scorpion's exoskeleton resulting in death. Application and placement are key. Another secondary usage of pesticides is to control their food supply. If their food supply is down, the idea is they will move to an area with a bigger supply. Bark scorpions can easily find a crack or crevice to invade a home, as they can fit through any space thicker than a credit card. Glue boards are a good way to trap scorpions in the home. The best place to stick a glue board is along walls near points of entry to the home, such as doors or windows. Scorpions are known for having bad eyesight, so they tend to walk along walls. This method is suited to homes with small children or pets, where using chemicals inside is not an option. On many homes in Arizona, there is a small gap where the foundation and stucco meet. This is an easy entry point for scorpions to gain entry to a home. A simple way to block off this entry point is to use caulk to fill the gap. The hot summer sun is too much for the bark scorpion, and they will seek shelter during the day. Common places to find scorpions during the day are wood piles, overgrown shrubs, cracks in block fences, and under loose rocks. Keeping these places to a minimum will help make your property less hospitable for scorpions, increasing the likelihood they will seek another area. ^ "Species Centruroides sculpturatus - Arizona bark scorpion". Retrieved June 18, 2008. ^ "Grasshopper Mice Are Numb to the Pain of the Bark Scorpion Sting". ^ a b "Scorpions". Cooperative Extension, College of Agriculture & Life Sciences. The University of Arizona. Retrieved June 20, 2008. ^ a b "Poison and Drug Information Center". The University of Arizona. 2008. Archived from the original on July 2, 2008. Retrieved June 20, 2008. ^ "Scorpion Management Guidelines". 2008. Retrieved June 18, 2008. ^ Phillips S.; Comus P. (2000). A Natural History of the Sonoran Desert. Arizona Sonora Desert Museum. p. 292. ISBN 978-0-520-21980-9. ^ "August 4, 2011 Approval Letter - Anascorp". 2011. Retrieved December 9, 2012. ^ David Von Behren, MPH (2000). "Soothing the Scorpion's Sting". The University of Arizona. Archived from the original on June 3, 2009. Retrieved June 20, 2008. ^ DesertUSA.com. "Scorpion Prevention and Scorpion Extermination (DesertUSA)". www.desertusa.com.